Simplifies cabling and system upgrades, making it ideal for ceiling-mounted and other permanent installations. 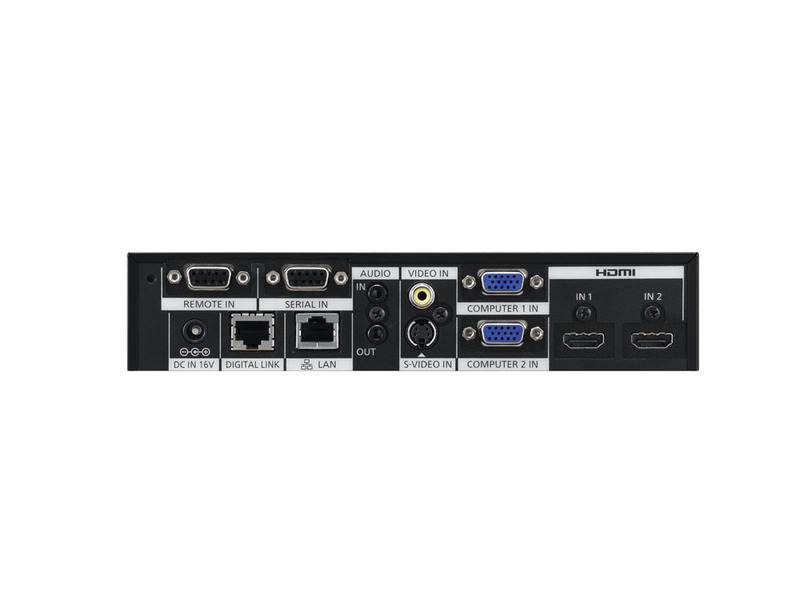 Abundant input terminals, including two sets of HDMI and RGB inputs. 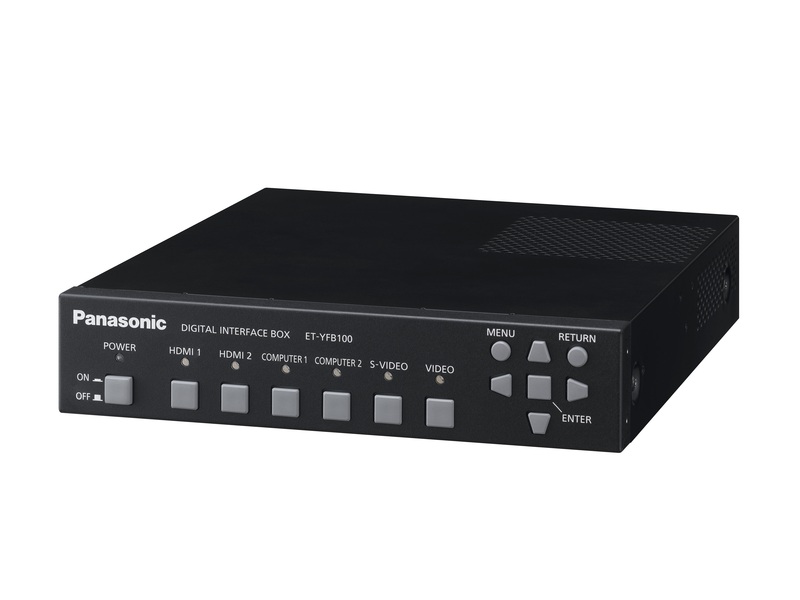 A separate audio output enables sound to be output when the display power is turned off. 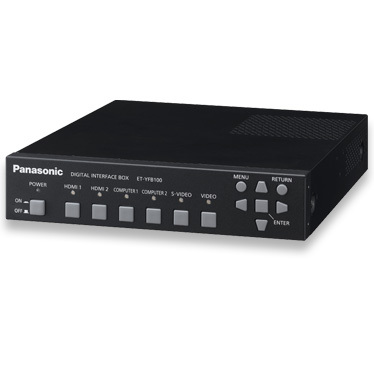 ET-YFB100G input can be selected with the remote control of a Panasonic display with DIGITAL LINK compatibility. 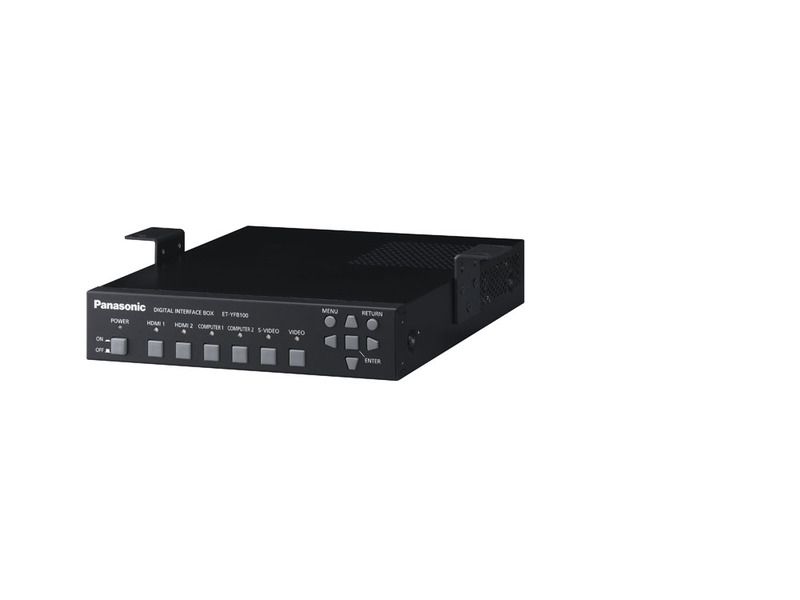 By combining the ET-YFB100G with a DIGITAL LINK-ready device, video, audio and control signals can be transmitted over a single cable. 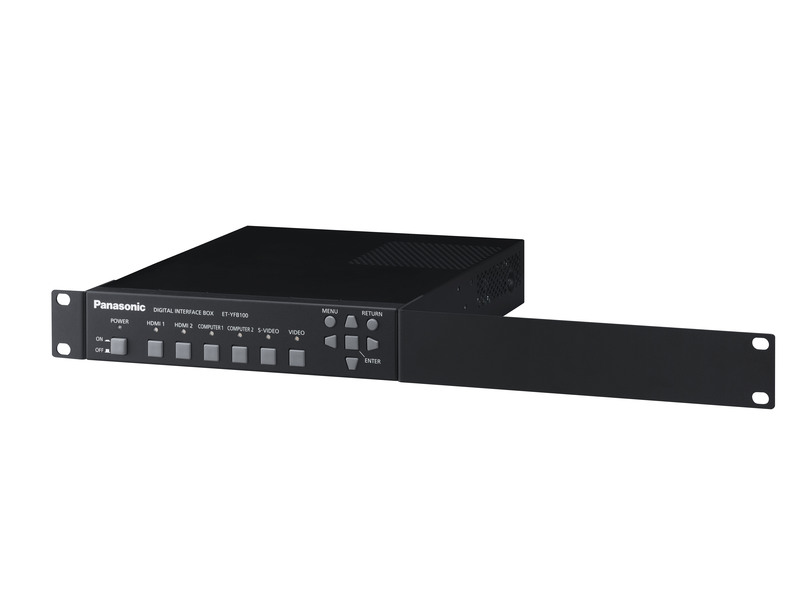 By combining the ET-YFB100G with a DIGITAL LINK-ready projector, video, audio and control signals can be transmitted over a single cable. This simplifies cabling and system upgrades, making it ideal for ceiling-mounted and other permanent installations. audio and control signals (Ethernet, RS-232C) for up to 100 meters (328 feet) through a single CAT5e (STP) cable or higher. A separate audio output enables sound to be output when the projector power is turned off. 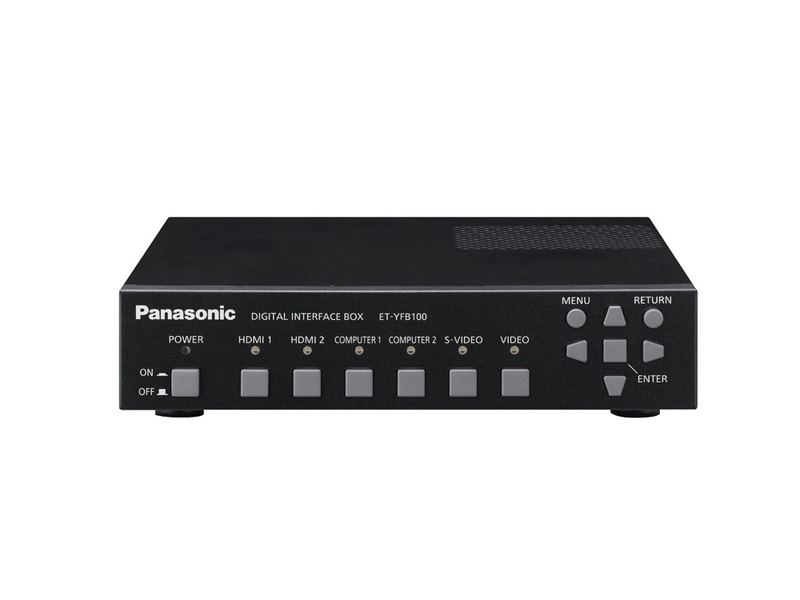 ET-YFB100G input can be selected with the remote control of a Panasonic projector with DIGITAL LINK compatibility. Digital transmission allows clear image and sound quality without any degradation even over long distances. Digital Cinema Reality converts interlaced motion image signals into beautifully smooth progressive images. The Auto Setup function automatically distinguishes the input signal and adjusts it to output the optimal angle of view. * The output setting for the ET-YFB100G should be set to AUTO. This scaling/resizing function does not support some formats. PT-EZ770ZE fixed installation. 6. Contact us. PT-EW730ZE fixed installation. 7. Contact us. PT-EX800ZE fixed installation. 7. Contact us. G: 0.7 Vp-p (1.0 Vp-p for sync on G), 75 ohms; B, R: 0.7 Vp-p, 75 ohms; HD/VD, SYNC: high impedance, TTL (positive/negative); NOTE: SYNC/HD and VD terminals do not accept tri-level sync signals.